I am a scholar of international and global history, with a focus on the place of Europe in the wider world. My research centers on the history of internationalism, the Catholic Church, and economic development. My first book, A Twentieth-Century Crusade: The Vatican’s Battle to Remake Christian Europe (Harvard University Press, 2019), explores how World War I galvanized the central government of the Catholic Church to craft its own variety of internationalism, which was intended to rival both liberal and communist internationalism. From 1918 up through the mid 1960s, the Vatican’s Catholic International made novel use of international law, public diplomacy, and new media to deepen the ties between Church and State and weaken perceived ideological and geopolitical rivals. Drawing on new archival research conducted in eight countries, the project shows how the Vatican’s internationalist activities decisively shaped European reconstruction after both World War I and World War II, and left a lasting mark on global politics, culture, and society. My second book, Failed Globalists: Economic Development, Decolonization, and the Demise of European Political Hegemony (in process), explains how Western Europe’s three leading political movements after World War II (Christian Democracy, socialism, and communism) sought to expand their influence both within Western Europe and in the decolonizing world through the crafting and implementation of rival economic development strategies. It investigates how these transnational movements used their economic development work to respond to the rise of the Bretton Woods economic order after World War II, and to the challenge posed to that economic order by the so-called Third World in the 1970s, as a range of countries in the Global South began calling for a New International Economic Order (NIEO) to redistribute wealth and redress imperialism’s wrongs. My teaching interests include the history of internationalism (especially liberal, communist, anarchist, anti-imperial, and Catholic internationalism); fascism; imperialism and decolonization; and the history of human rights, humanitarianism, and economic development. In my teaching, I encourage both undergraduate and graduate students to embrace history as a discipline that offers critical insight into the past and the present, and provides us with a handy toolkit of translatable skills, which are useful both in the academy and beyond. I’ve recently gotten involved in the Public Humanities initiative at the University’s Center for the Humanities, in an attempt to deepen ties between town and gown, and jumpstart the conversation about the role of the humanities in the wider world. Additionally, Scott Gehlbach (Political Science) and I have co-organized a seminar on History & Politics, so as to encourage cross-disciplinary dialogue and exchange. 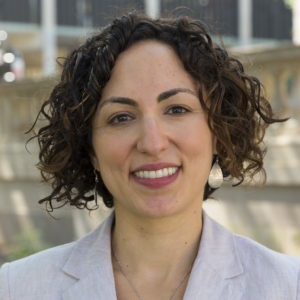 Our speaker series has been made possible by the generous support of the Brittingham Trust, the George L. Mosse Program, the Center for European Studies, the Intellectual History Group, the Comparative Politics Colloquium, and the Political Economy Colloquium. Please drop a line for more information. Giuliana Chamedes. 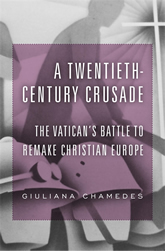 A Twentieth-Century Crusade: The Vatican’s Battle to Remake Christian Europe. Harvard University Press, 2019. “The Vatican, Nazi-Fascism, and the Making of Transnational Anticommunism in the 1930s,” Journal of Contemporary History 51,2 (2016): 261-290. “Introduction: Decolonization and Religion in the French Empire,” with Elizabeth Foster, French Politics, Culture, & Society 33, 2 (summer 2015): 1-12. “The Catholic Origins of Economic Development after World War II,” French Politics, Culture, & Society 33, 2 (summer 2015): 55-75. “The Vatican and the Reshaping of the European International Order after World War I,” The Historical Journal, 56 (December 2013): 955-976. “La Giac di Gedda di fronte alla crisi europea,'” in Luigi Gedda nella storia, Paolo Trionfini and Simon Ferrantin, eds. (Rome: Studium, 2013), pp. 325-336.